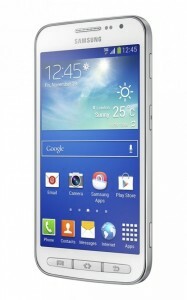 Samsung has announced the new Galaxy Core Advanced, an evolution of the Galaxy Core. It is a mid-range smartphone that complements the Samsung’s offer in this market range. The Galaxy Core Advance features a 4.7-inch screen, a dual core 1.2 GHz processor, 1 GB of RAM and 8 GB of internal memory, expandable to 64 GB via microSD card. It includes a 5MP rear camera and a VGA front one. It runs Android 4.2 Jelly Bean and is fueled by a 2000 mAh battery. The smartphone also includes some buttons for frequently used functions. There are specific keys for voice recordings, camera, volume, menu and the home button. In terms of connectivity the Galaxy Core Advanced offers Bluetooth 4.0, GPS with Glonass and NFC with S Bean, so users can easily share information – for instance, YouTube videos. The Galaxy Core Advance includes a lot of software features typical of the Galaxy series such as S Voice, the S Translator, Sound & Shot , Easy Mode and Play Group . It also includes several features designed to improve accessibility, as the Optical Scan that reads aloud text from an image, or the Light Sensing technology, which uses the camera to detect the direction and intensity of a light source. The Galaxy Core Advance is also equipped with Curtain Screen, which allows users to operate the phone with a black screen. This way, the device increases privacy while saving energy. Samsung has announced that the device will be available in blue and white, and it will reach the market next year. There is still no information regarding the price, but with this specifications is not expected to be an expensive device. In a near future, the company will also present a collection of accessories designed to enhance the performance of the Galaxy Core Advance.